The Giants can clinch their third post season berth under Bruce Bochy today. 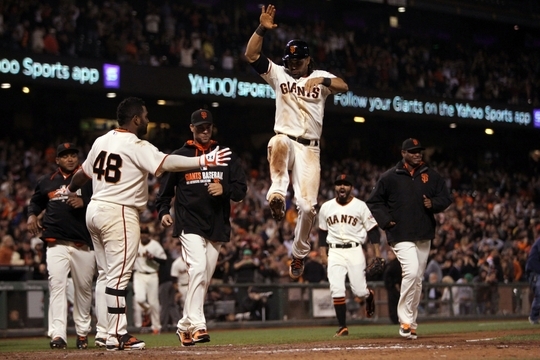 Hopefully San Francisco fans can truly appreciate what a remarkable run their team has had. Chances are it won’t last much longer. It is a City by the Bay episode of The Sully Baseball Daily Podcast. Kyle Lohse, Carl Crawford, Mark Buehrle, Ryan Flaherty, Brad Hand, Andrew McCutchen, Taijuan Walker and Josh Reddick all added to their totals for Who Owns Baseball? Posted on September 25, 2014, in 'SullyMetrics', MLB Podcast Network and tagged 2014 San Francisco Giants, bruce bochy, buster posey, Paul Francis Sullivan, san francisco giants, Sully Baseball, Sully baseball daily podcast. Bookmark the permalink. Leave a comment.